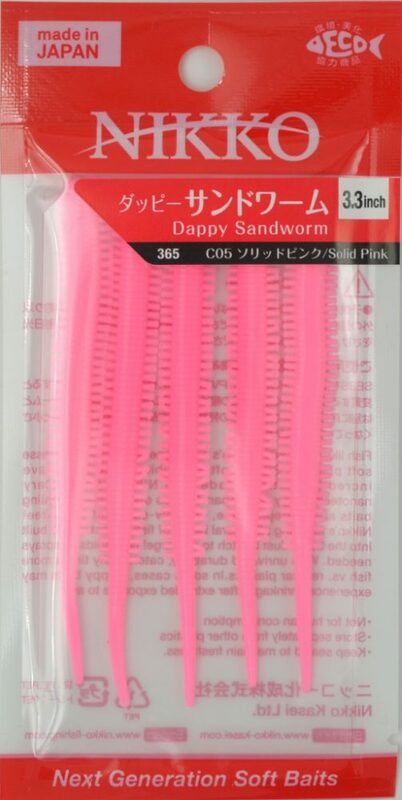 HOME > Product Release > Dappy Sandworms 3.3″ — great baits for many occasions! Nikko just release Dappy Sandworm 3.3″ in 6 colors (Bloody Red, UV Clear Red Flake, Clear Green, Glow White, Solid Pink, and Orange). They are built to imitate the real sandworms Made of Nikko’s floating and super soft Dappy material, the body and tapered tail move with the slightest of ease. Combined with high levels of scent and amazing softness, these sandworms look, move, smell and feel like the real thing. Effective in both saltwater and freshwater for a wide variety of species.